Catshill Learning Partnerships is an independent computing, ICT and e-safety consultancy, providing curriculum support to schools and training establishments. Founded in 2011 and based in the West Midlands with a team that cover the UK; our school based services also include professional development and educational technology advice. As well as offering advice and consultancy, we provide training on a one to one basis for small or whole groups including teachers, students, parents and pupils. Holding fully qualified teacher status with enhanced DBS checks, our advisors support teachers in the classroom. We also carry out reviews and assessment of online safety though the Naace ICTMark and SWGfL 360Safe initiatives. Catshill Learning Partnerships are CNECT Founder Partners A national network of trusted educational consultants who work together to provide quality support services for schools. Catshill Learning Partnerships is a Gaia Ambassador so you can get the framework as well as support (at a competitive rate) directly from us. Brett Laniosh is an education practitioner, founder of Catshill Learning Partnerships and NAACE Fellow with over 30 years of experience working in schools as a leader, a local authority advisor, key note speaker and a private sector consultant. He is keen to promote creative learning in schools and offers friendly, independent advice and training on a range of E-Safety, Computing and ICT themes. CEOP trained with NAACE ICT Mark and 360 E-Safe assessor status. He set up Catshill Learning Partnerships an award winning support service service for schools in 2011. Lynne Laniosh is a former teacher and academic coach who has also worked as a training provider for a national charity. She will be your point of contact when the rest of the team are busy out in schools. Mark Chambers is an experienced and successful provider of professional development, coaching and mentoring for head teachers through various leadership programmes. As a leader of a team of pedagogic innovators, he works in partnership with schools developing, identifying, evaluating and disseminating good practice in learning and teaching. In addition, Mark regularly supports the DfE, Ofqual and exam boards regarding the Computing curriculum. Previous roles include teacher, head teacher, private sector Curriculum Development Manager, local authority Transforming Learning Service Manager, local authority Head of Service and Chief Executive Officer of NAACE. Andy Checketts is a former headteacher, OFSTED inspector, assessment Manager, School Reviewer and SIP in Primary, Secondary and Special schools. Penny Earl is a former ICT Advisory Officer for North Lincolnshire Local Authority schools, responsible for standards and esafeguarding. She is the NAACE regional delivery partner for North Lincolnshire, working to improve learning and teaching with technology. Penny is a CEOP Ambassador, ICT Mark Assessor, 3rd Millennium Learning Guide, NAACE Fellow and Phase 2 Tutor. Penny has a particular interest in the role of technology to improve learning outcomes for pupils in the Early Years and Primary phases. Debbie Lewis is a former teacher with over 25 years experience covering Foundation to KS3. She works with schools to enhance learning experiences, improve independent thinking, problem solving, teamwork and motivation. Working daily with Android, Apple and Microsoft technologies, plus many other associated pieces of software, she has a wealth of knowledge and understanding of the ways that cross-curricular ICT can be utilised in the classroom. Susan Mehmet has over 30 years experience in the education sector having worked as a teacher (early years to year 6), primary computing advisor and learning consultant. She is also a CEOP ambassador. She offers support in a range of areas including online safety, digital literacy, the computing curriculum (planning, teaching/learning, assessment), new digital technologies and interactive whiteboard skills. Paul Wright is a former ICT co-ordinator, and LA School Improvement Officer. He is a NAACE regional Delivery Partner for Hull and the East Riding. He provides quality support service to schools to assist teachers, Teaching Assistants, SLTs and, not least, pupils to make the most of existing and merging technologies. He also teaches Computing at two Hull Primary Schools. Read our guest book to find out how we are received in class. I just want to say a huge thank you on behalf of the NLEC for your contribution to our training day. The feedback from the IT session was positive with 67% of attendees rating your session as good. Many thanks again for your time and input. Brett has proved himself to be a superb driver in moving Computing forward at Greenfield. He is held in high esteem by our staff as he has a professional approach and takes great pride in his work. There is no doubt that Brett works hard to identify and meet our specific needs. In particular we have used his expert advice to help us develop our bespoke website, which is tailored to our school and celebrates our work. Brett is a valued consultant in our school and would be a valuable asset to yours too. He is a skilled communicator to all audiences in a broad variety of media. He certainly knows his stuff. The sessions were engaging, informative and accessible for both our children and their parents. Brett shared the important message of E-Safety through a variety of activities that were enjoyed by all, but most importantly left no one present in any doubt of the importance of keeping safe in today’s technology filled world. Thank you. In January, a group of Year 4 and 5 children received a day’s training on becoming Digital Leaders. Brett was great and he really encouraged the children to think carefully about how they can keep themselves and others safe online. The children were engaged and enthusiastic throughout. Since the training, the children have been busy preparing an assembly and parent workshop for Safer Internet day and have created their own Digital Leader display board. The children really enjoyed the training and are keen to make an impact in their new roles. The presenter delivered an informative and intriguing introduction to Scratch. Providing a hands on course, teaching staff will get a real feel for the flexibility of the program whilst being made aware of the national curriculum elements that it covers. Thomas Smith, Westacre Middle School, Droitwich. Brett from Catshill Learning Partnerships came in to school for a day and worked with our year 7, 8 and 9 Digital Leaders in order to help them support the e-safety work we are engaged with. It was a very worthwhile and exciting day; the pupils found the experience meaningful and were able to create some great resources that will help the John Henry Newman community stay safe online. This work was invested back into school life to enable a proper coherent e-safety campaign designed and led by the Digital Leaders using Brett’s expertise. Since your training our Digital Leaders have been very keen to implement the ideas raised. They have conducted a whole school assembly covering a range of topics. The children really enjoyed the training and you could see that they were buzzing to go following it. It has given them a clearer picture of what their role is and the group a renewed impetus to develop their roles within their classes and within the school. Our Learning Partnership has provided a support package tailor-made to suit the needs of our school. Over the course of the last few months our Computing Curriculum Leader has received valuable guidance and advice from Brett in shaping an engaging and forward-thinking curriculum map. Brett’s input in staff training sessions and an e-safety workshop for parents was professional and insightful, again matching the needs of our school. Brett has been working within a coaching and mentoring model to give our staff confidence and expertise, this has been both positive and rewarding. Eye opening presentations for our parents and our staff which sent them away with plenty of positive information and practical advice. Parents also had the opportunity to share matters that they were particularly concerned about. Everyone who attended left the meetings feeling better equipped to deal with online safety issues. We also used Catshill Learning Partnerships to deliver a day of digital leader training for our pupils. They greatly enjoyed their day and are still buzzing about it! We were delighted with the two days training Catshill Learning Partnerships offered – it had all of our children considering their safety online. The presenter adapted the content from Year 1 to Year 8, engaging the children in the important subject matter. The parental information evening was well received and proved a valuable tool in helping educating young people in our community. We also enjoyed a 1 hour staff session, which highlighted some very real dangers for people in our profession. A group of children from year 4 and year 5 recently received digital leader training from Catshill Learning Partnerships. They have been very excited since and are very eager to implement their new skills. They have now set up regular meetings where they can discuss their roles and what to do next. They have planned an assembly and have also begun to design their own e-safety display. They really enjoyed the training day and have thrived in their new role within the school. We were given ideas and questions about The Chantry’s ICT state that were thought provoking and really helpful. Our consultant had great speaking and teaching skills; we learned a lot! He was very enthusiastic and motivational with the pupils and encouraged everyone to contribute! We now have lots of ideas to add to our progression with BYOD in the school. We would definitely recommend Catshill Learning to other Digital Leaders looking for some great training! We are going to keep in touch with Brett and his company and look forward to giving him a checkup on our progress in the future. A well planned presentation that was delivered in a very professional manner. The information was clear, relevant and enhanced by video clips that were up to date and illustrated points being made on different areas of online safety. Parent evaluation showed clearly that they appreciated the knowledge they gained to support them to keep their children safe. Catshill Learning Partnership’s Day of E-Safety was a great way to help us deliver the messages associated with Safer Internet Day. The Day of E–Safety was much appreciated by staff and pupils. We asked Catshill Learning Partnerships to help us deliver an overview of the computing element to our teaching staff. Brett worked with the Deputy Head to create a morning that was informative, inspiring and most importantly hands-on. Staff now feel more confident and energised in delivering the computing curriculum. The J2e course has developed our understanding of the application and we now feel better equipped to use J2e in the classroom. Staff were taught how to produce a document and create web pages. We particularly liked being able to create class photo pages to share with parents and we are looking forward to using the J2e suite. Mr Laniosh visited our school to talk to parents about internet safety and how to keep children safe whilst on-line. The evening raised awareness of the risks associated with a whole range of technologies, not just the internet, in a very engaging yet thought-provoking manner. Parents left the school with a set of strategies with which to manage their children’s digital world. Mr Laniosh was very well-informed, used current resources and was able to relate well with the parents. Every parent should definitely participate in such an event and I can thoroughly recommend Mr Laniosh and his company as the provider. Staff and pupils at Our Lady and St Kenelm School are really pleased that Brett came to offer us his services. I honestly did not realise when we met just how invaluable his work with us would be. As a result of his support, children are working at a much higher level with greatly increased skills, which we could never have even imagined. As a school, we are getting so much more out of our hardware, software and our contract with RM. Brett has supported our ICT co-ordinator in curriculum development and run informative workshops for staff and parents. His quietly, efficient manner means that he gets through a mountain of work each week with a minimum of fuss. The children love his lessons and are so proud of all that they have achieved. Staff are rapidly developing their skills and knowledge through working with him. I can see that we rely on his expertise more and more. We really could not do without his knowledge and enthusiasm for ICT- thank goodness we found him! We were looking to improve the profile of E-safety for all children. We decided that holding a day of E-safety sessions for the children, from Reception to Year 6, would be the best way to go. Brett liaised with the school to work a day to construct sessions that were appropriately pitched and engaged each child at their level of development. All came away with the message of e-safety was an important part of keeping safe in today’s modern society. The E-Safety for Parents presentation was very informative, punchy, fast flowing and is highly recommended for any school looking to support parents in the potential dangers of the internet. We have also used advice from Catshill Learning Partnerships to procure a large number of portable computers at a fantastic price. We are delighted with the service. An informative and enlightening presentation. We all felt the videos shown to us by Brett helped to “de-mystify” some of the issues around social networking and general use of the internet. It was also useful to those of us with slightly older children who are already immersed in the online world! We held an E-Safety for parents event in order to advise parents about keeping their children safe online. The parents commented that they found the advice about children’s use of Facebook and parental controls particularly helpful. They felt that overall the presentation had developed their understanding of E-Safety and that they now felt better equipped to deal with E-Safety issues. Brett has worked alongside a new ICT champion and ICT technician in a collaborative and highly effective way. Not only does he have the ideas that harassed heads appreciate he also has a proven track record of developing ICT across the school. Good short introduction – A great overview of functionality and applications available. Brett is very engaging and maintains a good pace throughout. Parents of children of all ages will benefit from seeing this presentation. The information and evidence is well researched. There is plenty of practical advice and ideas presented for parents to see, understand and then feel empowered to use afterwards. An informative and useful session. This was a very useful presentation that was really well received by our parents. It covered all the main areas of e-safety such as security protection, parental controls, cyberbullying, gaming and privacy settings and our parents were given plenty of practical advice. I can certainly recommend Online Safety for Parents to other schools. Since working with Brett in our school, the profile of ICT has risen enormously. He has worked alongside our new ICT Co-ordinator to audit our provision and suggest ways forwards. As a result of this we are now able to help the staff and pupils develop their skills in a far more effective way than before. Brett’s expertise has allowed us to find ways around problems that would have previously prevented the school from moving forwards. I can wholeheartedly recommend his expertise. Thanks for an informative and enjoyable evening. The mixture of your knowledge and enthusiasm coupled with some short but well researched and meaningful video clips really made our parents think. I would recommend your online safety presentation to parents of pupils of all ages. Following the fantastic training I have felt confident to import the pupils and staff log ins on my own and I have done this. The J2e training was very content rich, creating our own pages and links, every minute was useful. Thank you. Brilliant. The course has really developed our understanding of J2e. All our queries were covered, we feel better equipped to use the program in the classroom and the content was highly rated by our staff. Thank you! The course is a very useful introduction to the hardware and coding activities that can be carried out with the BBC micro:bit. It gives you the opportunity to try some hands on activities with the micro:bit. Parents found the Online Safety evening to be very informative and well presented. On behalf of parents please accept our thanks. The progress that our children have made working with Brett and our teachers has been excellent! After three hours of tuition, children in Year 6 are uploading work to the learning platform and making websites with hyperlinks on the J2E program. This has impacted on the rest of their learning as they are desperate to use their knowledge of the Portal and the J2E programmes in all areas of their work. More homework is handed in on time and the link between ICT and English is helping to drive standards. We are working with Brett each term and he is a very valued person in school. He has worked with all our staff, ICT Co-ordinator and website manager to raise the profile of ICT with our parents. His high level of expertise and his willingness to embrace new developments in ICT has meant we are always abreast of current thinking. He has worked on the Portal, J2E and online access with the staff and at present is designing our new parent-friendly website. He contributed to our 360° E-Safety Review and our achievement of ICT Mark Accreditation. Parents came to the online safety presentation and were shown a variety of ways in which the Internet can be a useful, but also how parents should be mindful of the potential dangers it also poses. Parents went home full of useful tips and food for thought and the next day a steady stream of parents came to tell me how the talk had informed them of things they had never considered before. Thank you for such an effective session. Brett is very knowledgeable about ICT in schools and has expert ICT skills which we have utilised well in the development of our new school website. We intend to use Brett’s skills to support the development of ICT within our curriculum, as well as the use of the Portal for children, staff and parents. We are very pleased with Brett’s contribution to our ICT and look forward to the future developments we have planned. His initiatives and input are invaluable at Amblecote. His knowledge and way of putting across the fundamentals have always been helpful and gratefully received by me and also the teachers he has worked with, both in the classroom and during Staff INSETs. Presently, he is supporting ICT across my school and is working with children and staff who greatly appreciate his input. He is a very personable practitioner, extremely reliable and is always willing to go the extra mile to ensure good quality in all he does. With his knowledge of the process and help, we managed to complete the 360 E-Safe Review, as well as highlighting the actions needed to achieve the award. Being able to suggest where evidence might be and by working with our Child Protection Officer as well as other staff has vastly cut down the time it would have taken me on my own. 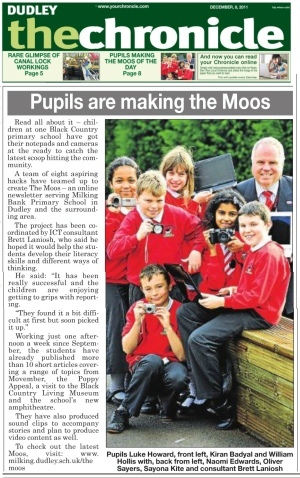 Brett has been supporting a group of gifted and talented pupils in ICT. He has produced with them a multi media magazine using a variety of ICT techniques, hardware and software. This has been a really valuable experience for the children and they have enjoyed working with someone with a high level of expertise in ICT. His relationships with the children have been excellent and he has enabled them to gain a great deal from the project, improving their learning and their skills. I have known Brett for a number of years and had no hesitation in using his knowledge and experience to support our ICT teaching at Milking Bank. His input has been well received by pupils and staff and I recommend him without reservation. We have worked with Brett on a number of occasions within our school. He worked with our children and staff and I found the E-Safety sessions well planned and delivered. He really did seem to build up a great rapport with the children who thoroughly enjoyed the sessions. The presentation on E-safety for parents and staff was very informative. It raised some key issues that could arise both at school and in the home. It has supported discussion around how to help keep children safe online.